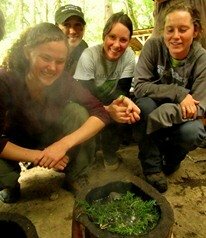 Medicinal herb gardening is a wonderful way to begin incorporating permaculture into your life. Growing useful medicinal plants allows you to experiment with small-scale sustainable gardening methods while helping you learn how to create your own home remedies. You can grow herbs to use towards treating basic ailments to maintain you and your family's health while cutting health care costs. It is easy to successfully practice medicinal herb gardening whether you have a large yard or just a couple of large pots or planters to work with. Permaculture considerations include careful selection of plant species, companion planting, and efficient design and layout. Garlic (Allium sativum): This famous culinary plant is also a powerful healing herb with natural anti-biotic and anti-fungal properties. It has immune-supporting qualities, and is excellent for colds and flus. This plant also helps repel many unwanted insect species from your herb garden. Parsley (Petroselinum hortense): This incredibly nutritious herb contains many vitamins (A,B,C) and minerals (calcium, iron, phosphorous, potassium and magnesium). It is useful as a healing herb in issues with urinary and kidney problems, as well as with water retention. Peppermint (Mentha piperita): This herb is great for adding flavor to foods, making teas and as an aromatic and beautiful addition to gardens. Medicinally, it is used for stimulating the appetite, as well as helping with indigestion, upset stomach, vomiting, flatulence and nausea. Be mindful to keep its roots in a controlled area, as it has a habit of spreading quickly and even out-competing other herbs. Rosemary (Rosmarinus officinalis): Another good cooking herb. Medicinally, it stimulates the circulatory system, helps calm digestion, and has overall antidepressant qualities. Comfrey (Symphytum officinale): All around excellent herb. It is very useful on wounds, sprains, bruises, burns and even broken bones. It also makes a great mulch. Lemon balm (Melissa officinalis): An herb with a heavenly aroma. As a tea, this herb helps calm the nervous system and stimulates the heart. It is very relaxing and can even dispel headaches and migraines. Like peppermint, this plant needs to be carefully contained so that it does not spread all over your garden. Chickweed (Stellaria media): A very common weed, this herb also happens to be good medicine. The entire above ground part of the plant is great in salads. It is also good as a poultice for burns, and for diaper rash. Dandelion (Taraxacum officinale): Yes, dandelion is a healing herb! All parts of the plant can be eaten, though the young leaves and flowers are the tastiest parts. This herb is rich in potassium, and is also a great cleanser for kidneys and the liver. Lavender (Lavendula officinalis): This famous, aromatic herb is useful for stress-based headaches, as a gentle nervous system tonic, and works well as an anti-depressant. Chamomile (Matricaria chamomilla): Another well-known herb, this plant has many uses. Chamomile tea and infusion are calming, as well as a mild digestive aid. A warm bag of chamomile leaves can be placed on a wound or on the eyes to help with inflammations and infections. The concept of companion planting is well suited to medicinal herb gardening. Companion planting is the practice of putting plants together so that they gain mutual benefits from each other such as pest control, encouraging higher yield, bringing up nutrients from deeper down in the soil and similar functions. Members of the carrot family such as celery, parsley, coriander (also called cilantro) do well together with members of the onion family like garlic or chives, as well as with rosemary. Rosemary, yarrow, chamomile and lavender are good companion plants since they have similar water needs. Yarrow and chamomile also increases the amount of essential oils that rosemary and lavender provide. Chamomile is a good plant to spread throughout your garden, as it seems to benefit many other plants. Comfrey, Chickweed, Peppermint, and Lemon balm are known to spread quickly in a garden. Plant them in a pot or planter to keep them from taking over. Whatever space you have available, whether deck, small yard or several acres, medicinal herb gardening is possible and fun! Keyhole and spiral garden designs are two great permaculture techniques for maximizing limited space when making a medicinal herb garden. Keyhole Beds: To create a keyhole garden bed, start with a circle of soil about 8 to 12 feet in diameter with a path coming into it on one side. Let the pathway end in the center of the circle, and leave yourself a circular space of 18 to 24 inches so that you can turn around. Make your beds 3 to 5 feet across. Plant the herbs in concentric rings in the beds. If you have the space, it is also possible to do multiple keyhole beds that branch off from a main pathway. 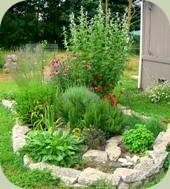 Herb Spiral: To start a small herb spiral, make a mound of good soil that is about 3 feet high and 5 feet across. Then, place fist-to-head sized rocks in a spiral pattern that winds from the bottom inward to the top. Leave around a foot of soil between the tiers of the rock spiral. Then, plant your herbs into the soil of the spiral. If you have more room, you can consider make more herb spirals or a much large spiral mound system for your plants. The spiral creates microclimates which can be used to aid the growth the plants in your medicinal herb gardening project. Plants like Rosemary, lavender and yarrow are sun loving species and might do best on the South side of the spiral. Meanwhile, plants that like cooler, moisture-rich environments such as parsley and peppermint can be placed in the North side of the spiral. As you work on your medicinal herb gardening project, remember to think about what your goals are with the garden, what species of plants you would like and how you would like to design it to fit your needs. Enjoy getting your hands dirty and watching your garden grow! It is incredible what you can accomplish with a little bit of soil, some water and a little work!